Dreamweaver separators were designed to give outstanding performance in lithium ion batteries. While safety is improved over conventional separators, the electrical performance will depend on the electrodes and cell design. However, there are a few advantages that can be designed in. 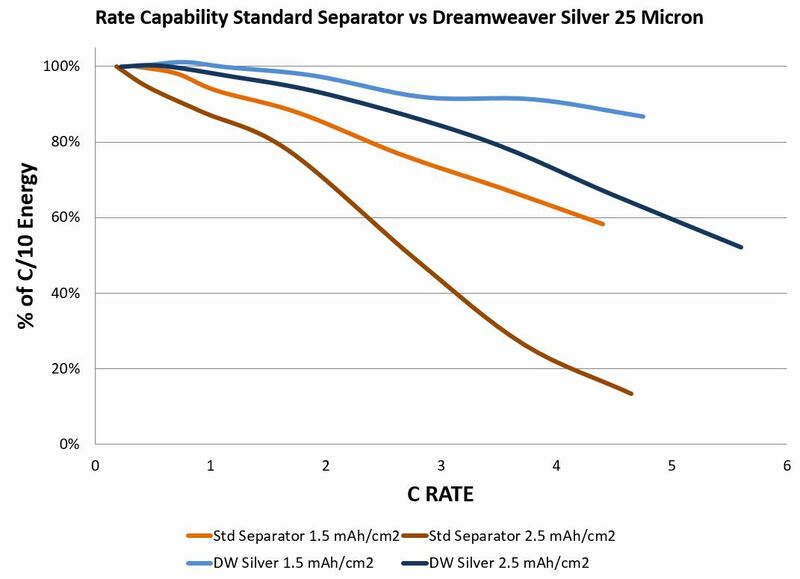 Dreamweaver separators have higher porosity and allow better ionic conductivity. In cells where the rate is limited by the separator, this can make a dramatic difference in cell performance, especially if power is a primary concern. In the test to the right, electrodes were made at two different coat weights of NMC cathode and matching anode, and each was built into cells with both a standard separator and Dreamweaver Silver 25. The results are dramatic: the cells made with Dreamweaver separator outperformed those made with the conventional separator, regardless of coat weight. 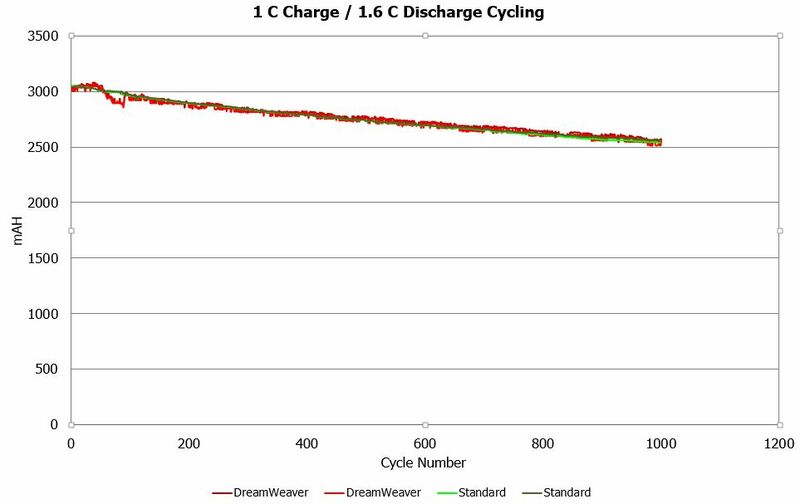 While this data is impressive, it carries another implication: if the performance of the standard separator at the heavy coat weight is acceptable, this cell can be redesigned with Dreamweaver separator at a heavier coat weight, reducing the amount of current collector, electrolyte and separator required in the build. The new cell would have 19% lower weight, 25% lower volume and 27% lower cost of materials. Click the button to the right for a white paper with more details. Improvements in cycle life will depend on the cell design and the electrodes used. To the right is one cell in which the improvement over a conventional separator is dramatic. 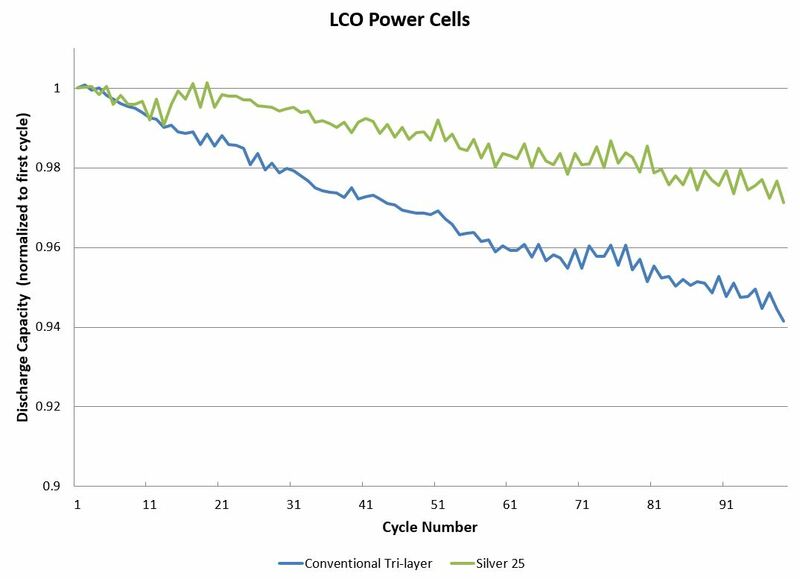 In a lithium carbonate cell designed for high power, the cells made with the conventional separator lost 5% of their energy in just 100 cycles, while the decline for cells made with Silver 25 was half of that. However, in production 26650 lithium iron phosphate cells, the cycle life is identical for over 1000 cycles. See the second chart to the left.